This chicken bacon ranch pizza recipe is super easy to make. It includes ranch dressing, chicken, Maple Leaf Ready Crisp Bacon, corn and cheese. Corn on a pizza?! That’s right! Although some of the toppings may not be very traditional for a pizza, the combination of them is delicious! To save time on the preparation, I always purchase a prepared whole wheat crust rather than making my own dough from scratch. What works great as a crust are the Pillsbury pizza crusts in those blue tubes in the refrigerator section at the grocery store. We make our own “deep dish” pizza but putting that dough into a round cake pan and pushing the sides up to make the crust tall. The ranch dressing base gives this pizza a taste that's different than your typical pizza. Mix sour cream & ranch dressing together until well mixed. Top prepared pizza crust with sour cream ranch dressing. 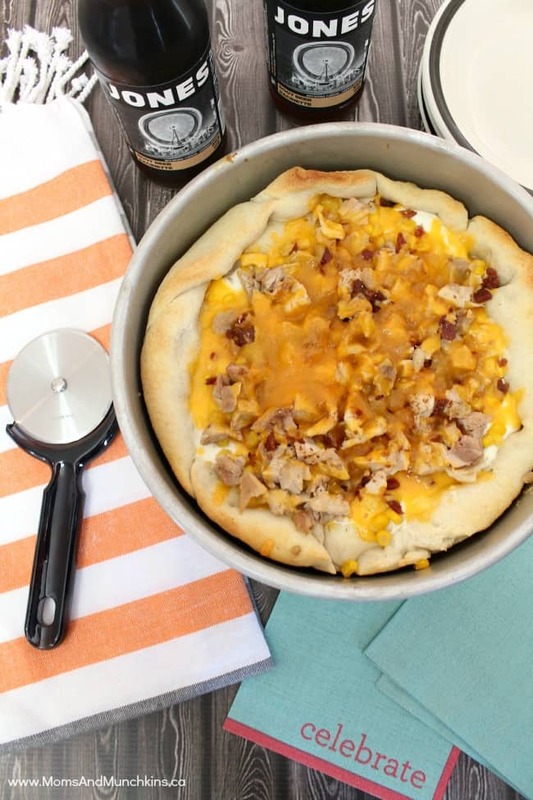 Scatter diced chicken, bacon and corn over pizza. Bake at 400 in oven for 10-12 minutes (until cheese is melted and slightly brown). What’s your favorite pizza sauce base? For more delicious recipes, check out our special Recipes page. We have tasty ideas for main dishes, appetizers and my favorite part of any meal – desserts! Have you followed Moms & Munchkins on our social media channels yet? We’re on Facebook – the first place we post new content; we’re on Pinterest – our most popular source of traffic; and we’re on Twitter. We’ve also just added Bloglovin’ to our social media channels – this is where you can receive little snapshots of the latest updates on all of your favorite blogs. We’d love to have you join our communities to stay updated on the latest ideas and to join in the conversations. That looks absolutely delicious!! Thanks for sharing! yum! My mouth is watering – the combination sounds good! My family would LOVE this! Thanks for the recipe. Oh my gosh. You said Chicken, Bacon, and Ranch in one sentence. Yummmmmm! Totally won me over! lol I’ve got a folder for all your recipes, btw! LOL! That looks so good! I am going to try it. I absolutely love pizza!! Oh my goodness…so yummy looking! This sounds delicious!! It’s going on my list of meals that I need to make! Sounds rich and hearty! Thanks for linking up this past week. I’ll have the new party up later this afternoon and would love to have you back! Sounds like a very filling, delicious dinner idea! My family will love it! It’s really delicious! I hope you enjoy it too. Now this is my kind of pizza! Pinned. Stopping by from Sweet Sharing Monday. Have a great week! Thanks for the link up – I’ll see you again next week! Sounds super YUMMY! Thanks for sharing on Simple Supper Tuesday. Thanks for the fun link up party! See you again next week. This looks awesome!!! We would love it if you would link up at our linky party. Looks great – very cheesy! Now this is something new and different. I’m intrigued. 😀 Thanks for sharing on beColorful.